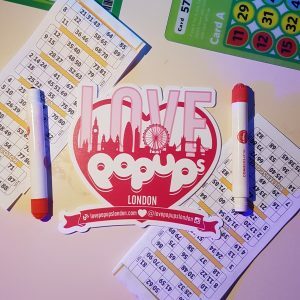 Last night I was invited by Love PopUps London to attend the Players Bingo press night in Camden. Every Saturday and Thursday, Players take over the Mecca Bingo hall in Camden for a modern take on the classic game. 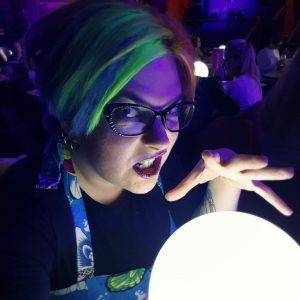 With a faster paced, funner game of Bingo, monthly changing pop-up catering, bespoke cocktails, and a live band. 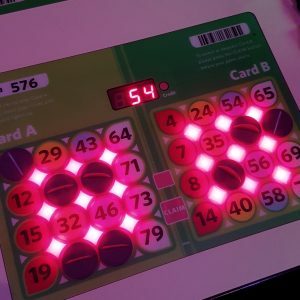 We were treated to three full rounds of Bingo, with two short electronic games inbetween, as well as free flowing cocktails and platters of food from their current pop up kitchen Cheeky Burger. 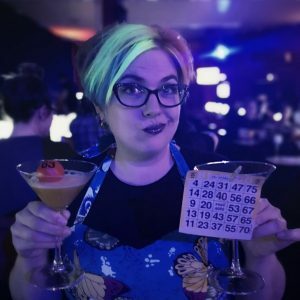 The night started out great with a big welcome in the lounge and plenty of Bingo themed cocktails to choose from. As someone who doesn’t drink alcohol, they were even happy to make a virgin version for me to enjoy. I have to say, the bar staff really went above and beyond, clearly being extremely stressed and under pressure, they were super friendly, up for a quick chat, and fantastic at their jobs relentlessly mixing up impressive cocktails. Once we had settled into the large Bingo hall, the very chaotic food services started. A few tables here and there were given large platters with a variety of burgers, wings, fries, onion rings and more. However, there didn’t seem to be much of a system to who was being served, as part of our large party were immediately served while others waited for over an hour. By the time my table was given food, we were already deep into the second game of Bingo and had spent over an hour and a half in the building. The serving staff was quite rude to us and eventually literally slammed a platter onto our table without a word, after another member of staff had accused us of being rude when we had merely asked if we were going to get food as well, an hour after the rest of our party had already eaten. The food we were served was barely lukewarm and very bland, though this might have been due to it just having sat around for too long and no longer being fresh. I don’t feel I can properly review the food for the above mentioned reasons. One of the main organisers of the night did apologise to us for how we had been treated and tried to make up for it by giving us drinks tokens, which was a nice gesture. I’d still recommend to stay away from the food options here as the serving staff were the only ones in the entire venue who weren’t friendly and customer service oriented. I do understand that they’re still in their early days of organising, so this might well change down the line. And the organiser who spoke to us was definitely concerned as well as very welcoming and fun, so hopefully they’ll get a grip on this aspect of the night as well. 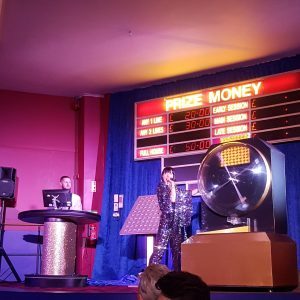 The Bingo games themselves were very fun, with a chipper host who tried to get the crowd going and had a good handle on the proceedings. It could have been a little more intense, as I’ve experienced with other modern Bingo events, though. 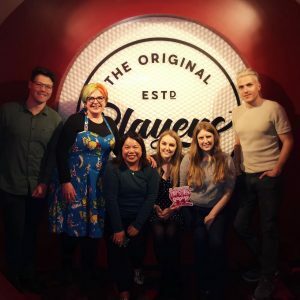 We certainly enjoyed the suspense and fun atmosphere, though our games were interrupted several times as previously mentioned, so I’m not sure we could fully enjoy all of it. The live band was fantastic, if a bit loud, and definitely contributed to the overall atmosphere. 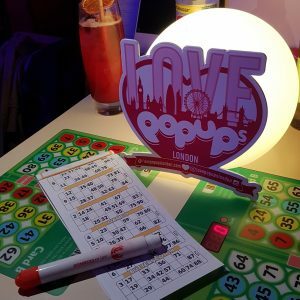 We did have great company, fantastic drinks, and fun Bingo games though and I would definitely give it a go again on a less chaotic night. With cash prizes and other fun items to win, including a kayak and a large drone, it’s fun for all ages and a great night out! If it had been a little more over the top, a little more glitz and glamour, a little more crazy, I’d have given it more points. The way the night went it was definitely enjoyable and fun, but not something to write home about. I hope Players find their feet and smooth out their service. Understandably a press night can be more chaotic than a regular play event, so maybe it was just that. I’m happy to give them the benefit of the doubt. The way the night went and with previous modern Bingo experiences in mind, I’m giving Players three and a half out of six rainbow sloths.